I've consistently used Google Maps for years, but after reading this article, I'm going to give Apple Maps a try. It's pretty solid. Outside of transit, Google Maps is way overhyped. Another decent maps application is Here, formerly by Nokia. Here is especially useful if you're looking for offline maps capabilities. Compared to Apple Maps, Google Maps has all these big labels, descriptions, etc. that take up about a quarter of the screen (especially on nav mode) so the actual map space is so small. It annoys me no end that they assume everyone has bad eyesight. You mean a default, built-in app is used by more people than one that requires download? I like using it but I keep going back to Google maps as Apple maps is still not there by a long shot. Not when it comes to data points and certainly not on search. and when it comes to somewhat rural location it’s not even a competition. In case you were wondering about the peaks, mapping apps are always used most on the weekends. Now this is app usage from a sample of over 8 thousand users. However the article was talking about requests. So I would guess that the reason there are 3x more requests from Apple Maps is people searching for different text to try to find the thing they are looking for! Where as in Google Maps they probably find it the first time. 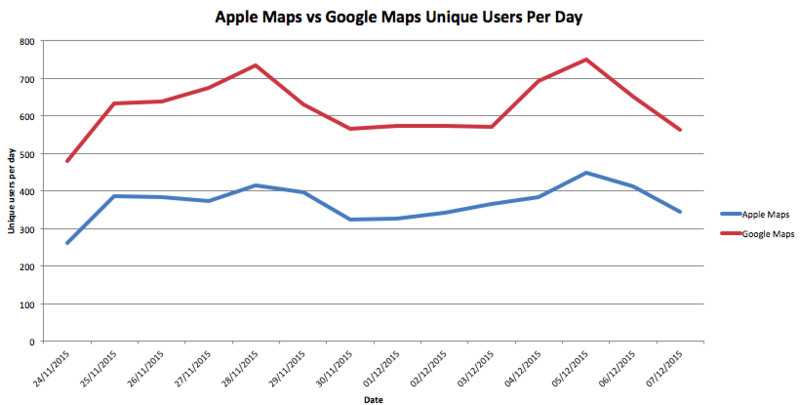 I am surprised that Apple Maps is used more. It is probably because one has to download Google Maps. Google Maps seems to offer more with bicycle routes and 3D maps. Apple Maps has traffic info only for a few countries. Without traffic, route calculations are incorrect. So basically Apple Maps don't work in most of the world. Furthermore in Thailand, roads and waypoints are so far behind Google Maps it isn't funny. Not a high priority country I suppose despite large resources at their disposal. Been waiting years for Maps to work but it just doesn't. Sad. I live in the UK and until Apple come up with anything remotely useful or as good as street view, faster/slower re-routing, accurate traffic mapping and satellite imagery that has a history option then google maps will remain literally 'streets' ahead. Only reason Apple maps is served up on my iPhone is because the apps take me there by default, not by choice. Ow wow, a built in app is used more than a third party. Surprise. - Google Map has a much better global coverage for transit stuff. - When you are traveling from A to B, the system prevents you from pinching in/out, very annoying. - Google Street View is so much more useful than a 3D map. Killer feature. - Google Maps is much more reliable when it comes to real-time traffic updates. I don't know what the issue is with Apple maps. I've been using it since it came out and I've never had an issue either finding what I'm looking for or getting directions. Maybe it's just better in Australia! How about accuracy and efficiency of directions from Point A to Point B, i.e. not leading people around in circles? I suppose this data is U.S. only. I subscribe most comments here: the data accuracy and ubiquity of Apple Maps is not even remotely as good as Google Maps in The Netherlands. I even switched to Google Maps for Public Transport from local (good!) public transport apps, after they added real time delay information. For normal navigation Apple Maps is fine and accurate, but for complicated navigation in busy cities Google Maps is way better and more accurate. Furthermore, although it's beautiful, I find myself never using the Apple Maps Fly Over feature, while often using Streetview. That said, I like the minimalistic approach of the Apple Maps navigation. I would like apple to add. Drop pin to drop pin routing (not all places have names). Street view. I think the reason is very simple. Google Maps is disabled, but Apple Maps is available in China. I am a Lyft driver and I have tried all 3 major nav apps: Waze, Google, and Apple Maps. Apple work best by far in the Seattle area. This doesn't surprise me. I'm never going back to Google Maps. They are NOT more accurate and their sattelite view is crap compared to Apple's. When I was in France last year, I tried using Google Maps to get me to my hotel in Arras and it placed the hotel 4km away from where it actually was. It should have been within walking distance so we had all of our suitcases with us. Then, in Paris, it kept getting us turned around in different directions from the one we needed. The argument that Google Maps is better because it's been around longer is no longer valid. The only thing it has going for it is Street View and even that is getting to be a horrible experience sine they forced everyone to change to their new layout. In Europe I used Maps exclusively and deleted google maps completely because of the frequent errors and usability. Maps just worked better and was as good if not better at finding things I needed. Now I'm in SE Asia Maps is pretty useless and Google is the only real solution even though it's not ideal by any means. I wish Apple would throw some money at this, maybe hire some people on the ground to do some of the legwork. It's horrible using google maps knowing google are tracking everything I do. I have tried to limit my use of any Google product, as i find more and more targeted ads based on whatever i last typed into said Google products. I am just not comfortable with that. I travel cross country several time per year and I favor using the back roads and stay off the interstate systems as much as possible. When Apple Maps came out I did a side by side between Apple Maps and Google Maps. They both had errors but Google had far more points of interest and less errors. I also logged the errors and reported them to both Apple and Google. Google fixed them promptly. Apple? Not so much. Fast forward. I still do this comparison 2-3 times a year. 4000 miles round trip. Different routes every time. The roles are reversed. In Rural areas, Google maps is rife with errors and is woefully out of date in areas on construction. Most errors are silly transpositions turning a 2654SW Street into a 2564SW St. But Apple maps are FAR more accurate in rural settings now. In in the cities, they are about the same. Google maps show more POI but are far more cluttered and harder to read. Apple Maps are more sparse on displaying POI but look cleaner. They both seem to have the same POI's in their database.